Sewing Modkid Style....another stop on the tour - Stop staring and start sewing! 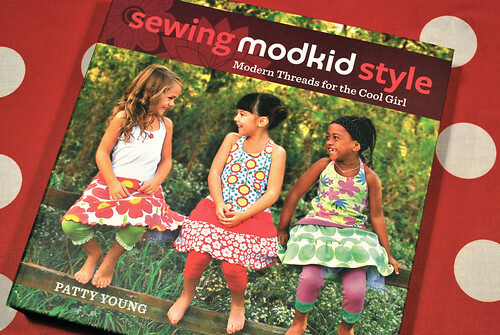 I'm so thrilled to have my turn on Patty Young's Sewing Modkid Style blog tour! Once I had the book in hand I couldn't wait for my chance to show you what a great and necessary book this is. There are a lot of really terrific books on sewing childrens clothing out there but this one is unique. It's all about knits! If you've never sewn with knits you're in for a thrill. Knit's are so quick to sew together and so forgiving when you make beginner's mistakes. When my 3 girls were little I bought two books on knits by Kwik Sew called Sewing For Toddlers and Sewing For Children and used them all the time (I had to get two books to cover their size ranges). It was quite an investment because each book cost nearly 20.00 (and this was in the early 90's) but I felt it was worth it since I used the patterns again and again. I was so disappointed when I found out they were no longer in print because I really wanted to encourage people with kids to consider getting them. Patty has solved my dilemma with this beautiful book and I'm strongly encouraging you to get it! It costs less than I spent on the two books I had to buy way back when and the sizes range from 2 - 10 so it will stand the test of time. There are some hip and stylish projects in here (like the fingerless gloves pictured above) but the ones that thrilled me the most were the more basic items that I know I would use again and again. The Not-So-Plain Tee, pictured above, will be a sewing staple. T-shirts go together in minutes (honestly! ), whether you have a serger or not (Patty covers sewing with both types of machines in her book) and they don't take much fabric. This swim suit is just perfect for girls! It allows enough coverage for them to really wiggle around without it slipping and the skirt has shorts included. I wish I'd had this pattern when my girls were little because it was such a challenge to find age appropriate swimwear in the stores (it still is!). I really love everything about this swimsuit! And look at this Swim Cover-Up. It's got a hoodie and a pouch pocket for carrying things like sunglasses or a tube of sunscreen. Patty smartly used terry for this version and it's genius. Absorbant and comfortable. The nice folks at Wiley Publishing are giving away a copy of Patty's book to one of my blog readers. Just leave a comment and I will draw a name on the 16th and they will send a copy of this great book out to the winner. Be sure to visit the other blogs in this blog tour (listed below) for more chances to win. Many of them created some of the projects from the book and they are darling! And join the Sewing Modkid Style group on Flickr to see what everyone is making and to find some inspiration! Even if you don't win I suggest you add this book to your wishlist right away because I think it will quickly become the resource for sewing knits for girls and you will get years of use out of it.